I'm Laura Grace Weldon. I'm a writer, editor, and unrepentant library addict. 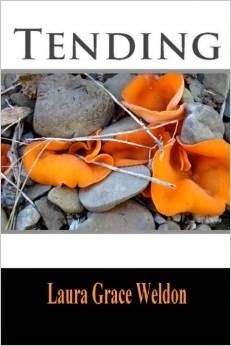 My new book is a collection of poetry titled Tending. 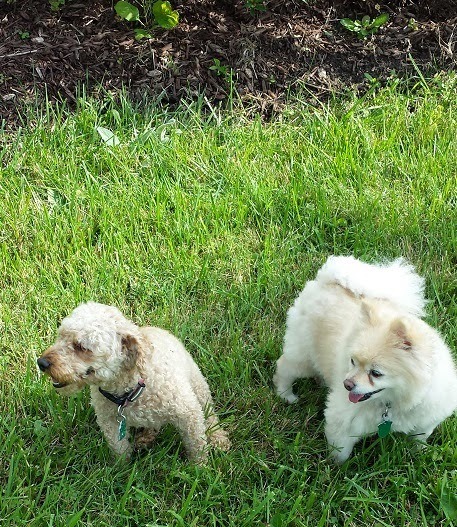 I live on Bit of Earth Farm with humans, livestock, and two high personality dogs -- Winston (four year old Pomeranian) and Cocoa Bean (8 year old Toy Poodle). Post-walk relaxation during which I read and dogs sprawl. My husband roasts small batches of coffee twice a week and it tastes so damn good that it has ruined me for coffee served anywhere but home. He orders all sorts of different raw beans, so what we drink is always changing. This week's beans are Nicaragua Dipilto Finca La Laguna. These guys go for a walk most afternoons, either down our rural street or off to the park. After the walk they demand dinner. They nosh on raw ground meat, a little cheese, and a smidgeon of whatever vegetables I've got around. After dinner it's Festival time. I don't know how this became de rigueur, but after they've eaten and gone out they each get a piece of Hare of the Dog or Lucky Premium jerky. As I open the pantry door to get out their treats they run happily room to room with uncontainable eagerness. They observe this ritual with dedicated fervor. A day cannot pass without the post-dinner Festival. Afterwards we sit and relax. Coffee for me, full tummies for them. 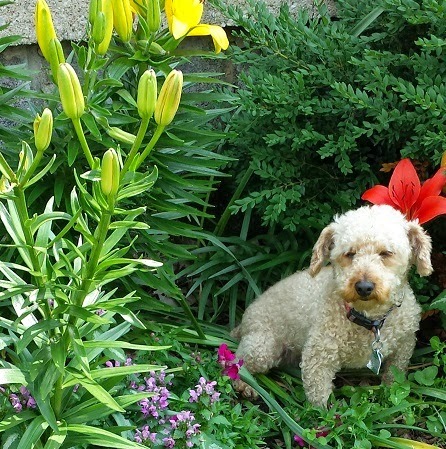 When you last appeared on the blog back in 2010, you reported that Cocoa Bean was "clever, affectionate and a bit neurotic." Have those neuroses faded or gotten more interesting? Alas, the neuroses have not faded. Cocoa Bean tends to wear a forlorn expression, like someone who reads nothing but Dostoyevsky. He trembles at the slightest stress and shakes like a paint mixer on car rides. When I go out back to the cows and chickens my family reports that he puts up his chin and howls mournfully. If I leave in the car he positions himself on the back of the couch, watching the driveway for hours and sometimes refusing to eat or drink until I get back. Let me hasten to add, his life truly isn't stressful. He's treated with warm affection and, because I work from home, has my near-constant companionship. 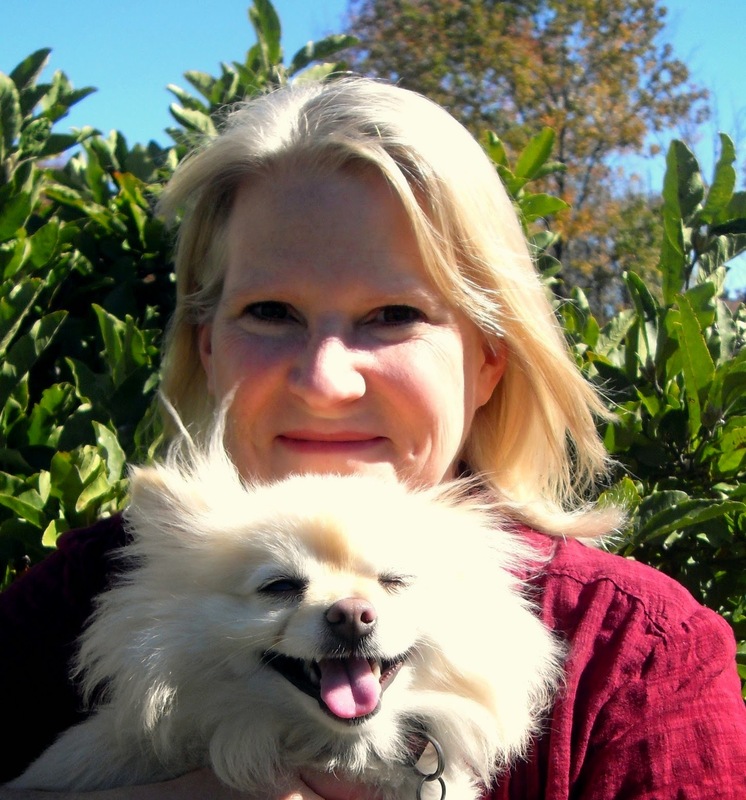 Do Winston and Cocoa Bean do more to help or hinder your writing? Help. Cocoa Bean has a lair under my desk where he likes to spend the day. Winston's favorite nap spot is up against the rungs of my chair. This makes it hard to move, so I'm stuck working. Have any actual dogs inspired dogs in your published work? I love dogs. All dogs. They can't help but appear in my writing, Here's a poem inspired by Cocoa Bean in my recent collection. like whales breach tigers lunge hawks soar. toward the one who named him. to what we call spirit. from every rock tree star. My hand was on the door to let the dogs out. I just so happened to be belting out Ode to Joy with improvised lyrics lauding the delights of peeing in the snow. This was meant to encourage the dogs to go out (perhaps to escape my singing). Unbeknownst to me, an innocent FexEd guy was on the other side of the door, finger poised to ring the doorbell. I hope this qualifies him for trauma-related workman's comp. These guys don't care for toys. Not even sticks. They play an energetic version of chase-through-the-house and love to run in the yard. They sniff derisively at the dog toys we keep for them, that is, unless a visiting dog noses in their toy basket. Then, suddenly, they care a great deal. 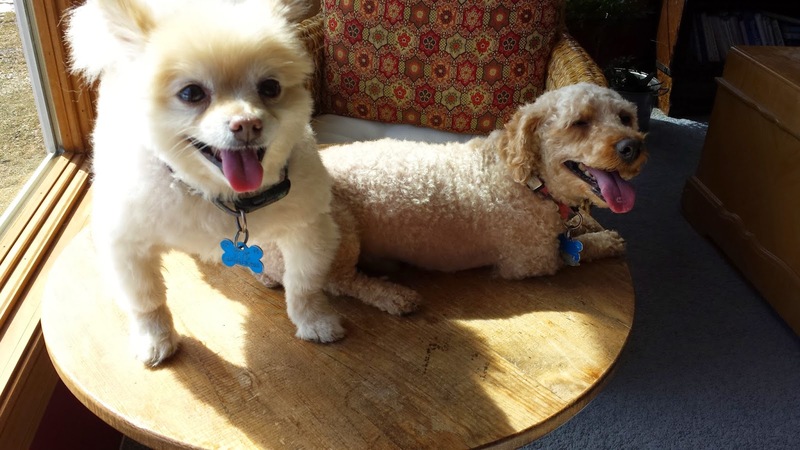 Who are Winston and Cocoa Bean's best pet-pals? They prefer their humans and each other. Visiting dogs inspire them to hide. If Winston and Cocoa Bean could change one thing about Ohioans, what would it be? Winston wants all Ohioans to visit and adore him. He reigns over parties, enjoys greeting people on walks, and in a season of well-deserved glory appeared onstage in several Wizard of Oz performances. He got fully into the character of Toto, came when called by that name, skipped with Dorothy at the right time, and stayed in his assigned basket despite a scary shrieking witch, flying monkeys, and loud fake thunder. 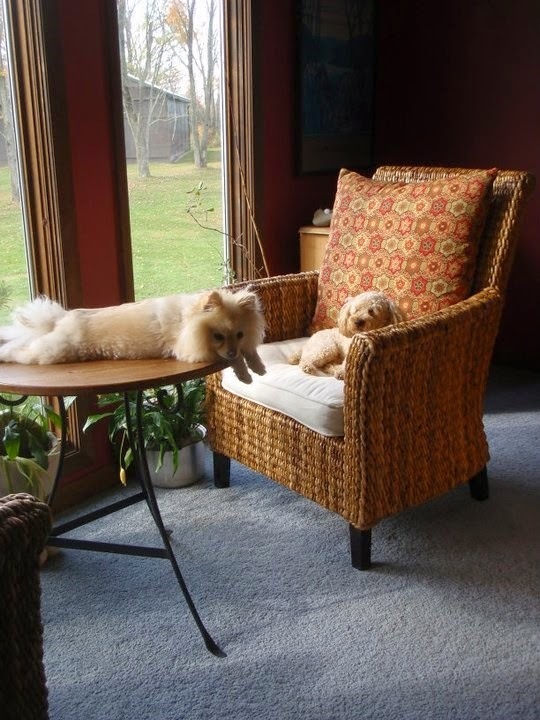 Cocoa Bean [photo right] would like all Ohioans to stay away and never, ever visit his home. He doesn't want them to knock on the door or drive down the street, he most certainly doesn't want his humans to leave him to visit other people. If Winston and Cocoa Bean could answer only one question in English, what would you ask them? Tell me about the sounds you hear. If Hollywood made a movie about your life in which Winston and Cocoa Bean could speak, who should voice them? Winston would expect nothing less than a top star. He'd probably agree to Bradley Cooper or Robert Downey Jr. He'd expect the actor to grow lush hair in order to get into character. Cocoa Bean would need an actor well-versed in voicing angst. I'm thinking Woody Allen. What advice would Winston and Cocoa Bean give if asked? Both advise people to take up gardening. They love it when I'm planting and weeding. They investigate, chase, and forage for tasty things like fallen tomatoes. Learn more about Laura Grace Weldon's poetry collection, Tending, and her handbook of alternative education, Free Range Learning. Visit the author's blog, website, Facebook page, and Twitter perch. Just don't knock on her door. She may be singing.